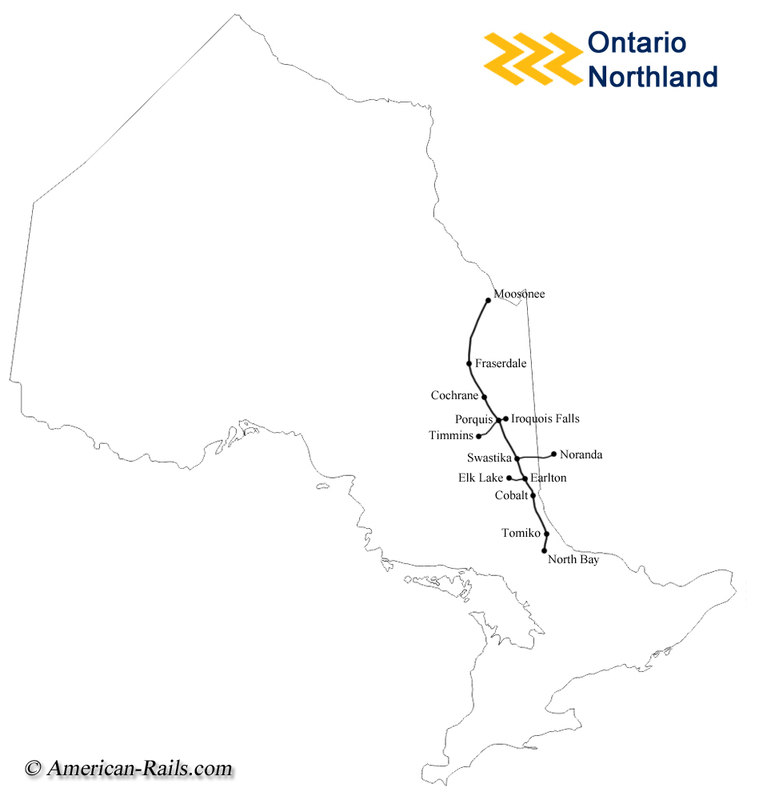 The Ontario Northland Railway (reporting marks, ONT) grew into one of Canada's largest regional systems, spanning more than 500 miles in length between North Bay and Moosonee in the province's eastern region. Since it was first incorporated during the early 20th century (when the railroad was then known by a different name) the ONR has been fully owned by the local government although it has shown some interest in recent years to sell the property. 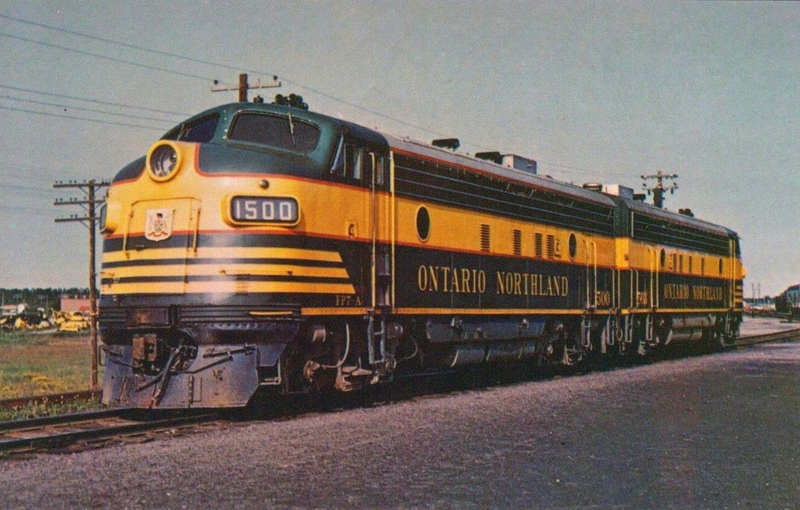 For more than 100 years the Ontario Northland has offered passenger service despite one its classic trains, the Northlander, being suspended in late 2012 to the dismay of local residents. Today, the railroad's freight relies on a wide mix of traffic although it is still heavily dependent on the natural resources that were first discovered in the region around the time construction first began during the early 1900s. At the turn of the 20th century farmers and settlers located at the head of Lake Temiskaming were pressing the government to open up the region for better economic opportunities by improving transportation. At the time, save for steamboat travel, trekking through Ontario's northland and the yet-to-be-explored "Canadian Shield" was a hazardous and near impossible task on foot or horseback. Due to local pressure, Ontario parliament appropriate $40,000 in 1900 to study the possibility of laying a new railroad through this uninhabited region. Feeling the prospect was justifiable the government chartered the Temiskaming & Northern Ontario Railway on March 17, 1902. The system was essentially planned to serve local agricultural interests and the initial surveying laid out a railroad that would span 114 miles from North Bay to New Liskeard. Within three years this route was opened by 1905 but additional northward expansions soon followed. By then the T&NO had already witnessed a big change in how it would be operating in the region; instead of only providing rail transport for agriculture a large influx of settlers began flowing into the area when silver was discovered at Milepost 103 in 1903 (just outside of Cobalt). Soon after the railroad was chartered the new company was led by J.L. Englehart, appointed by Premier, Sir James Whitney. Englehart was already a wealthy entrepreneur having owned his own oil company at the young age of 19 and knew how to run a business. He soon realized that the T&NO had great potential since it lay within a region rich in natural resources, notably timber and later, iron ore.
After the T&NO was initially completed to New Liskeard it continued to expand northward almost immediately reaching Englehart by 1906 and Cochrane by 1908 (where a connection was made with the National Transcontinental Railway, which later known as the Canadian National). During the next fifteen years the railroad built four different branch lines to tap copper, iron, timber, and other various types of freight. These spurs reached Elk Lake (via Earlton), Timmins (via Porquis), and Iroquois Falls (also via Porquis). Lastly was the much larger extension to Noranda in the province of Quebec that began in 1923. This would serve that area's lucrative copper mines but Canadian law stated that when a railroad crossed into another province it immediately came under Federal jurisdiction. To circumvent this the Ontario government purchased the small, electrified Nipissing Central, which had already been chartered under Federal laws. As such, the extension to Noranda would be used under this name but the plan was halted at the Quebec border until the King's Privy Council, then Canada's supreme court, ruled on the matter. Eventually, Ontario was granted approval for its extension into the Noranda copper fields, which was opened for service in 1927. Around the same time the T&NO had been attempting to open its main line to the James Bay. However, with new premier Howard Ferguson now in power from the Conservative Party he felt the railroad was a drain on public moneys and further construction was stopped. By then the railroad was opened to Fraserdale. During the next decade it was finally able to reach its destination at James Bay, opening the line to Moosonee (about 15 miles from the bay itself) on July 15, 1932. This constituted the extent of the T&NO's system, which was a little over 550 miles in length (including branches and main lines). One problem which had been plaguing the Temiskaming & Northern Ontario was, of all things, its initials. The "T&NO" letters were actually better known for Southern Pacific's subsidiary, the Texas & New Orleans operating in the Deep South of the United States. As such, Ontario's T&NO was constantly running into the problem of seeing its freight cars mistakenly routed to that railroad. 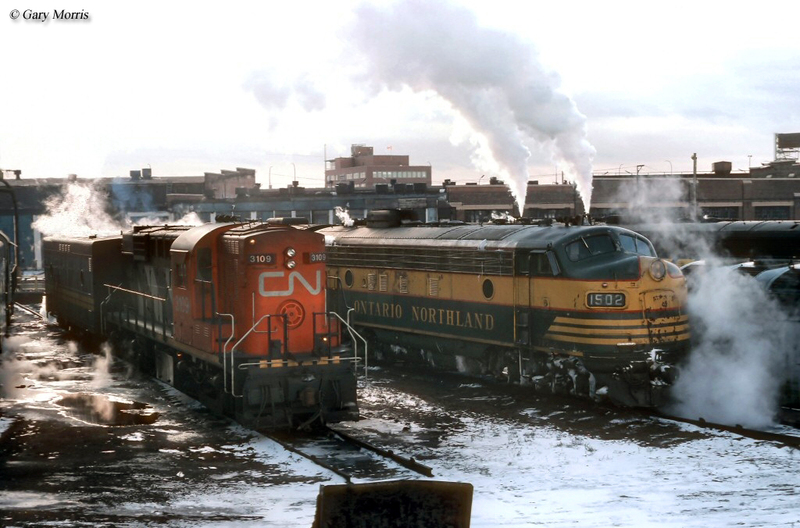 To alleviate this problem the T&NO was formally renamed as the Ontario Northland Railway on April 5, 1946. During the 1960s the ONR saw several new mines open along its system producing additional iron and copper. These supplanted its other sources of freight which ranged from general merchandise to agriculture. By this the time the railroad had already fully dieselized, acquiring mostly General Motors Diesel (GMD) products but also purchasing a few Montreal Locomotive Works (MLW) models as well. 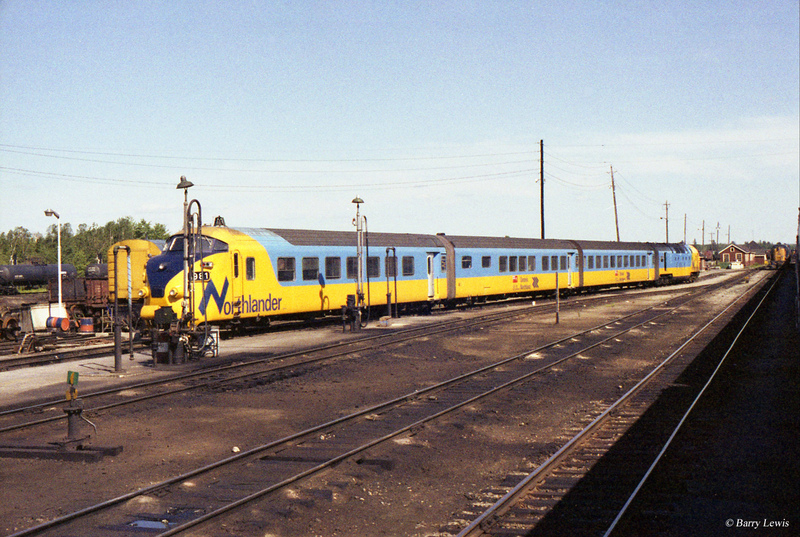 During 1977 it also acquired four trainsets of the RAm/DE "Trans Europ Express" (TEE), passenger trains used in Switzerland and the Netherlands which the Ontario Northland used as part its Northlander, running between Cochrane and Toronto. These interesting-looking trainsets were of classic European design and are still well-remembered despite only being used until 1984. The ONR continued to carry on as a fully owned arm of the government until the turn of the 21st century when plans were announced in late 2000 to privatize the railroad. While offers were solicited the plan never came to fruition and to this day the Ontario Northland Railway remains publicly owned. Despite the loss of the Northlander after September 28, 2012 today the ONR still offers the Polar Bear Express from Cochrane to Moosonee and the Dream Catcher Express as a limited excursion from North Bay to Temagami.